How do you turn your body into a fat burning machine, run faster than Usain Bolt, recover from exercise immediately and wake up each day bursting with energy? According to some people, the ketogenic diet is your answer (learn the basics of this diet here). This high-fat, moderate protein diet that is practically void of carbohydrates forces your body to use fat for energy. LeBron James supposedly tried it and offensive lineman decided to give it a shot after an ex-NFL center and O-line coach LeCharles Bentley recommended it. However, the offensive lineman and LeBron weren’t actually following a ketogenic diet. Though these athletes didn’t really know what they were following (no worries LeCharles, I’m sure your nutrition advice is on par with me coaching the O-line), people who actually follow it swear by it. Could this be an unconventional path to weight loss and better health? Unfortunately, the ketogenic diet craze has been fattened with misinformation. Eat Fat, Lose Fat? Does the ketogenic diet make you lose weight? How does this diet impact muscle? The ketogenic diet and athletic performance. I am not covering “training low” or low carbohydrate / non-ketogenic diets in this article. During the first several days on a ketogenic diet your weight will take a nosedive. Carbohydrate is stored in the form of glycogen in liver and muscle. Each gram of carbohydrate is stored with 3 – 4 grams of water. Decrease your carbohydrate intake, use glycogen and you’ll lose water weight very quickly. Weight loss, even if from water, can motivate people driven by the number on the scale. Given that adherence is the number one predictor of weight loss when on a diet, we can’t discount psychological effect of the number on the scale going down. What happens if you stay on the diet? A group of NIH researchers admitted seventeen overweight or obese men to a metabolic ward and placed them on a high carbohydrate baseline diet for four weeks followed by four weeks on an isocaloric ketogenic diet (this diet contained the same amount of calories as the high carbohydrate baseline diet). The men lost weight and body fat on both diets. 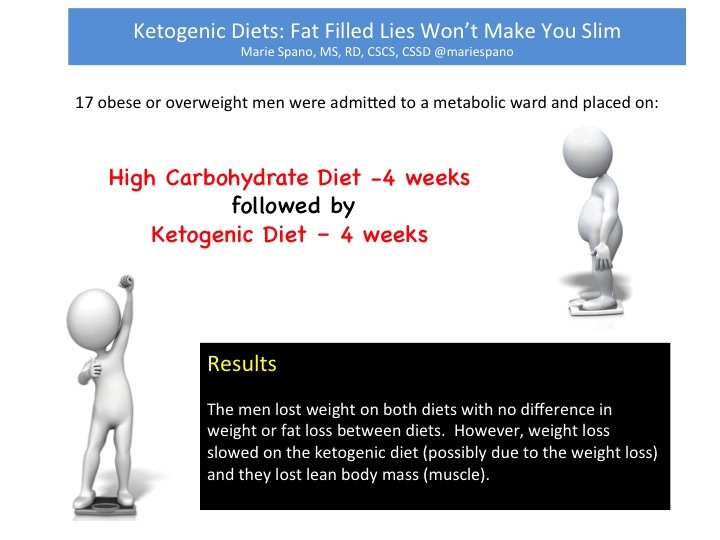 The ketogenic diet did not lead to greater fat loss as compared to the high carbohydrate diet and in fact body fat loss slowed during the ketogenic diet and subjects lost muscle (1). Time to chuck the “carbohydrates make you fat” books in the recycling bin. What about other studies showing ketogenic diets help athletes lose body fat and maintain performance? These studies were not actually using a ketogenic diet protocol but instead were high fat, high protein, low carbohydrate diets. Also, none of the studies measured if the study subjects were actually in nutritional ketosis (2, 3, 4). See the section on The Issue with Ketogenic Research Studies for more information on this topic. Regardless of the studies indicating the ketogenic diet will not lead to greater weight loss as compared to a diet composed of the same amount of calories, some may lose weight because they will end up cutting down on their favorite foods. Fewer food choices often means fewer calories consumed. Muscle Up with the Ketogenic Diet? The ketogenic diet isn’t high enough in protein for maximal muscle gains. Using the lower end of fat intake on a classic ketogenic diet (80% of calories), one could consume 15% of calories from protein (112 grams) on a 3,000-calorie diet. Protein requirements are at least 1.2 – 1.8 grams of protein per kilogram bodyweight (or 0.55 – 0.82 grams per lb. bodyweight) per day if training and eating a diet with enough calories to maintain weight. Protein needs go up if you are cutting calories to spare the breakdown of muscle tissue when dieting. On this diet, 112 grams of protein equals just under 1.3 grams of protein per kg bodyweight for a 200 lb. person and even less for anyone who weighs more. In addition to inadequate protein intake, “the ketogenic diet reduces many of the signaling molecules involved in muscle hypertrophy (growth),” states Dr. Antonio Paoli, M.D., B.Sc., Associate Professor and Vice Dean of the School of Human Movement Sciences, University of Padova. Without getting too technical, even with sufficient calorie intake, the ketogenic diet suppresses the IGF-1 / AKT / mTOR pathway (5). Using ketones for energy slows muscle breakdown. However it doesn’t stop this process (5). Once fully adapted to a ketogenic diet, athletes can supposedly rely on a seemingly endless supply of body fat for energy. No need for carbohydrate gels, beans, gummies and sports drinks every 15-30 minutes during long runs, rides or triathlons to sustain energy levels. Fewer calories consumed may make it easier for some people to stay within their total daily calorie needs (though if you are training that much staying within your calorie requirements shouldn’t be difficult). Trading carbs for fat seems like a huge benefit for athletes, particularly endurance athletes who train and compete for several hours at a time (6). In addition to utilizing body fat, fat actually produces more energy (ATP) (5). 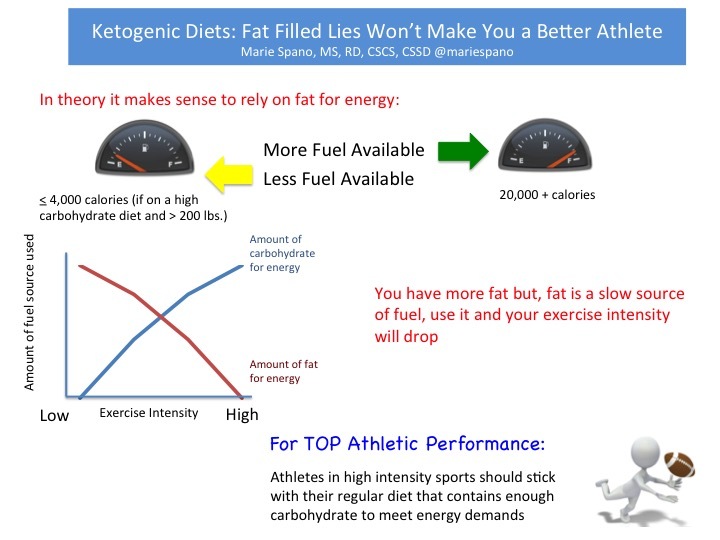 However, fat is a slow source of fuel (see graphic below), the human body cannot access it quickly enough to sustain high-intensity exercise and therefore, this diet is really only (potentially) applicable to ultra-runners and triathletes competing at a relatively moderate to slow pace. In a ketogenic diet study examining athletic endurance, researchers had subjects cycle at a snails pace (equivalent to a heart rate of about 120 beats per minute for anyone 20-30 years old or 115 for a 40 year old) until they became exhausted before and after 4-weeks on a ketogenic diet. There were no differences in the amount of time they were able to cycle before getting tired prior to or after the four-week ketogenic diet (7). In studies examining high fat diets (not ketogenic and ketones weren’t measured) and endurance performance, study subjects relied on more fat as opposed to carbohydrate during low intensity exercise, yet there was no clear performance advantage on the higher fat diet (8). A recently published study examined 20 elite ultra-marathoners and Ironman distance triathletes. Some were habitually consuming a traditional high carbohydrate diet while the other group was following a ketogenic diet (slightly adjusted macronutrient ratios yet they were in ketosis as measured by blood ketone levels). As expected, those following a higher fat diet used a greater percentage of fat for energy while the higher carbohydrate diet group used more carbohydrate for energy during a 180 minute submaximal running test (I’d call that leisure running intensity). There was no difference in calories burned over the course of the run. Both groups had the same level of perceived exertion and there was no test to determine performance differences between groups (9). If there’s no performance benefit and we know carbohydrates work, why follow this diet? If your primary goal is weight loss, it doesn’t matter if you use more fat than carbohydrate while exercising (SN: can we please stop talking about the fat burning zone) as long as you’re burning more total calories over the course of the day. Plus, in the interest of (if you are not an ultra endurance athlete) jack up the intensity and burn as many calories in a short period of time as possible. Unfortunately, a ketogenic diet won’t help you do that – when relying on fat for fuel, the intensity of your exercise will drop – the body simply can’t access fat (a slow source of energy) quickly enough to sustain high-intensity exercise. Instead, carbohydrates are necessary for high intensity activity. Here’s the issue with many ketogenic research studies and media reports based on them: in most cases, the study subjects were not actually following a ketogenic diet – they were following a higher fat, high-protein low carbohydrate diet (10, 11, 12). Each person’s carbohydrate and protein limits needed to stay in ketosis vary and therefore, measuring ketones through blood or urine is the only definitive way to determine if you are in ketosis. Complicating matters more, low carbohydrate diets (including ketogenic diets) lead to a substantial drop in carbohydrate content, and associated water stored with it, in muscle. This change overestimates the drop in lean body mass as measured by DEXA. There are no modifications, higher protein intakes or “on again, off again” (where you go on it one day and off it the next) to this diet. You must be in a state of nutritional ketosis or you will need to decrease carbohydrate and protein intake even further to get into nutritional ketosis and rely on ketones for energy. Ketogenic diets help decrease incidence and severity of seizures in epileptic patients (this is what the diet is intended for). Also, ketogenic diets may be beneficial when implemented soon after a traumatic brain injury (including concussion) (13). In addition, scientists are examining if this diet is beneficial for diseases that affect the brain such as Alzheimer’s. If you want to lose weight, the ketogenic diet is not superior to a reduced calorie diet. Also, unless you are an ultra endurance athlete who just loves dietary fat, hates eating at social occasions and can put up with the potential side effects from this diet it isn’t for you. 2 Zajac A, Poprzecki S, Maszczyk A, Czuba M, Michalczyk M, Zydek G. The effects of a ketogenic diet on exercise metabolism and physical performance in off-road cyclists. Nutrients 2014;6(7):2493-508. 3 Rhyu HS, Cho SY. The effect of weight loss by ketogenic diet on the body composition, performance-related physical fitness factors and cytokines of Taekwondo athletes. J Exerc Rehabil 2014;10(5):326-31. 4 Paoli A, Grimaldi K, D’Agostino D et al. Ketogenic diet does not affect strength performance in elite artistic gymnasts. JISSN 2012;9:34. 5 Paoli A, Bianco A, Grimaldi KA. The ketogenic diet and sport: a possible marriage? Ex Sports Sci Reviews 2015. 6 Volek J, Noakes T, Phinney SD. Rethinking fat as a fuel for endurance exercise. Eur J Sport Sci 2014;2:1-8. 7 Phinney SD, Bistrian BR, Evans WJ, Gervino E, Blackburn GL. The human metabolic response to chronic ketosis without caloric restriction: preservation of submaximal exercise capability with reduced carbohydrate oxidation. Metabolism 1983;32(8):769-76. 8 Burke LM, Kiens B. “Fat adaptation” for athletic performance: the nail in the coffin? J Appl Physiol 2006;100(1):7-8. 9 Volek J, Freidenreich DJ, Saenz C, Kunces LJ, Creighton BC, Bartley JM, Davitt pm, Munoz CX, Anderson JM, Maresh CM, Lee EC, Schuenke MD, Aerni G, Kraemer WJ, Phinney SD. Metabolic characteristics of keto-adapted ultra-endurance runners. Metab Clin Exp 2016;65(3):100-110. 11 Paoli A. The ketogenic diet and sport: a possible marriage? Ex Sci Sports Sciences Rev 2015;43(3):153-62. 12 Johnstone AM, Horgan GW, Murison SD, Bremner DM, Lobley GE. Effects of a high-protein ketogenic diet on hunger, appetite, and weight loss in obese men feeding ad libitum. Am Society Clin Nutr 2008;87(1):44-55.
it just isnt true what you claim, no matter your sources. My experience over at least 18 months with myself alone, has allowed me to not only shed 60lbs, total body fat has been reduced to NOW typically 10-14%, and to top it off resting heart rate @52YO has went down to 51-52 BPM, perhaps I get a little more protein and a little more carbs than a typical ketogenic diet, and a little less fat but I consume ketones daily, and as much good fat as I can per day, whcih always includes lot of high fat nuts. Hi Elijah, it sounds like you cut food choices and cut calories. That alone = weight loss. Also once you lose weight many health risks will improve, your HR will lower etc. Its been my experience that weight loss slows down with time. So, did they ever do a study where the ketogenic diet went first? For some reason I didn’t see many comments on my blog until now. You are 100% correct. Kevin Hall (I wish I could find this commentary I read online a while back) suggests this is partly from diet boredom. People get bored and go off their diet. You mean ketogenic diet first and then another diet? I’ve seen keto / carb loading (which means the results can’t be attributed to keto + the way they measured lean mass makes this study a carb depletion / carb loading study). Trying to understand here (without bias or judgment – I’m genuinely interested in what works, and what doesn’t). If the idea behind a ketogenic diet is that, due to its effect on hormones and satiety, it makes it easier for people to reduce their caloric intake, then doesn’t an isocaloric study eliminate the key variable? In other words, if the idea behind a ketogenic diet is that it makes it easier to consume fewer calories, then isn’t this NIH study both pointless and misleading? Excuse my late reply as I didn’t see a number of comments on my blog. Nope, as long as the study is ad libitum (eat as desired – different than this NIH study; though we as humans eat for a number of non-hunger reasons). The NIH Study was novel because it paired diets head to head. There’s nothing special about the ketogenic diet for weight loss though as you point out, some suggest it increases satiety (I covered this again the other day: http://www.mariespano.com/eating-fat/). Ketones are the result of using more fat for energy, higher ketones doesn’t mean you are losing a ton of body fat. Pingback: All diets work if you stick with them. They all help you cut calories. Pingback: Ketogenic Diets and weight loss: eating fat won't make you thin. When you get rushed to the hospital with kidney stones and gall bladder pain, and your leg cramps at night are so severe you jump out of bed screaming (no matter how much magnesium you take), and you start vomiting at the sight of eggs and meat, it’s time to come to your senses, grab an apple, and ask yourself why anyone with half a brain in their head would ever think a ketogenic diet is a good idea. Wow! That is rough. Thank you very much for sharing your story! the main study (1) to support your refusal of ketogenic diet in “eat fat, lose fat?” has been refuted and rebutted by other doctors. Ludwig refuses to believe anything that doesn’t support his preconceived notions. Biased science at it’s best. Thanks for the good advice I will try to take a look.